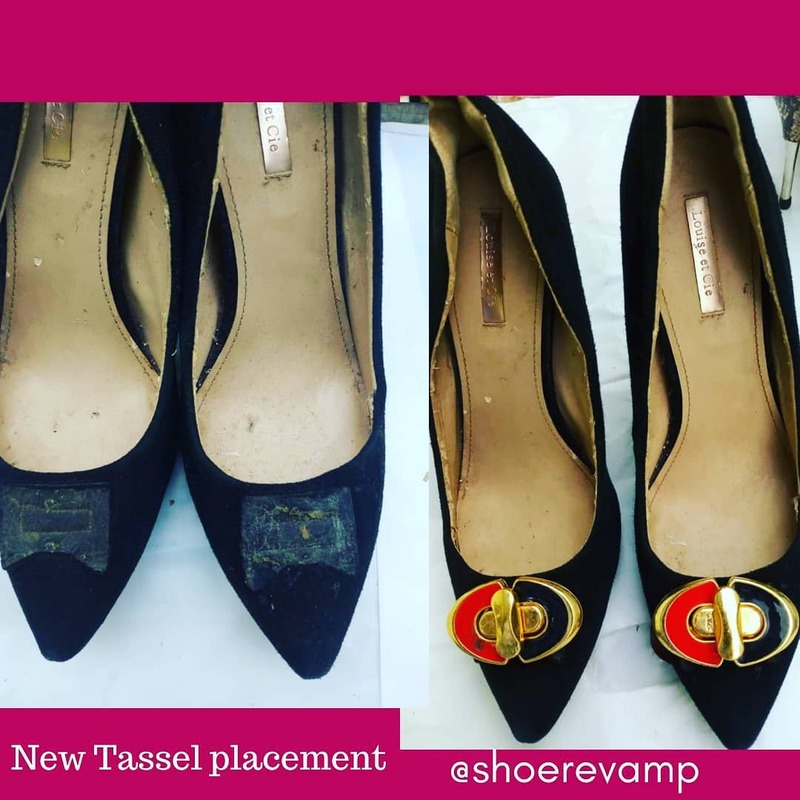 Do you know You can turn your old shoes to new ones again rather than buy another?.Made in Nigeria brand "SHOE REVAMP" is our shoe saviour! I have this great love for flat ballet pumps. I fell in love during my childhood watching kids practicing ballet dance on the TV and I couldn’t wait to travel out and join them. HEHE! Unfortunately, my dream of becoming a prima ballerina was not achieved, but the love for ballet and ballet shoes remained. Even though it no longer looked particularly great and had been worn into submission, but it’s so comfortable that I felt I had to save it and turn it into something gorgeous – probably a shiny silver flats. 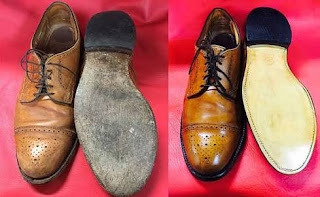 Every one of us has a favorite shoe that makes us sad when they no longer look great and wished they could revamp it. Thankfully, all that will be made possible thanks to Made in Nigeria Shoe Revamp brand. Yayyy!!!!! KMB: Can we meet you? ShoeRevamp: My name is Austin Okpagu . 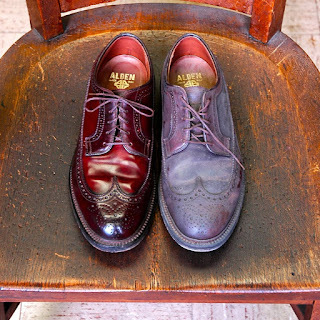 I'm the Head Cobbler at ShoeRevamp. I love shoes and I’m always happy whenever I see a pair of beautiful shoes on people's feet. 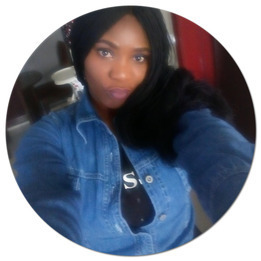 I have both a B.Sc and M.Sc degree in Psychology and currently pursuing my PhD in organizational Psychology at the University of Nigeria. More importantly, I'm a strong advocate of repair over replace. KMB: How did you find yourself in this choice of career? What was your Eureka moment? ShoeRevamp: ShoeRevamp was borne out of my frustration with finding a quality shoe repair service that didn't make me to pull my hair out or one that delivers my repaired shoes to my door. I observed that every other service in our lives was getting easier to access and more on demand. 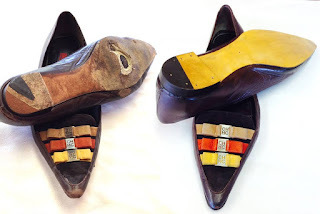 I began to wonder why shoe repair was so far behind the times. I was determined to change this narrative, hence SHOEREVAMP came into being. 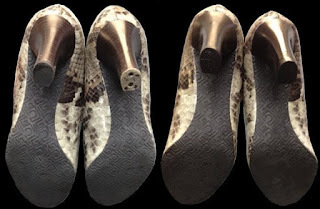 KMB: Shoe revamp is as unique as a Made in Nigeria brand names gets, how did you come up with it and what does it denote in relation to your brand? ShoeRevamp: Before we came up with the name, we had to think critically about how we want to be perceived when we show up. 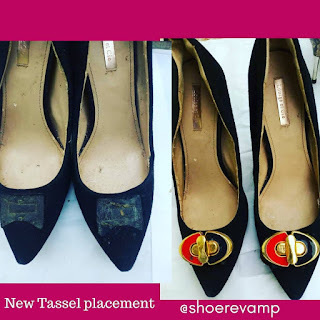 ShoeRevamp doubles as a registered company as well as the brand name. 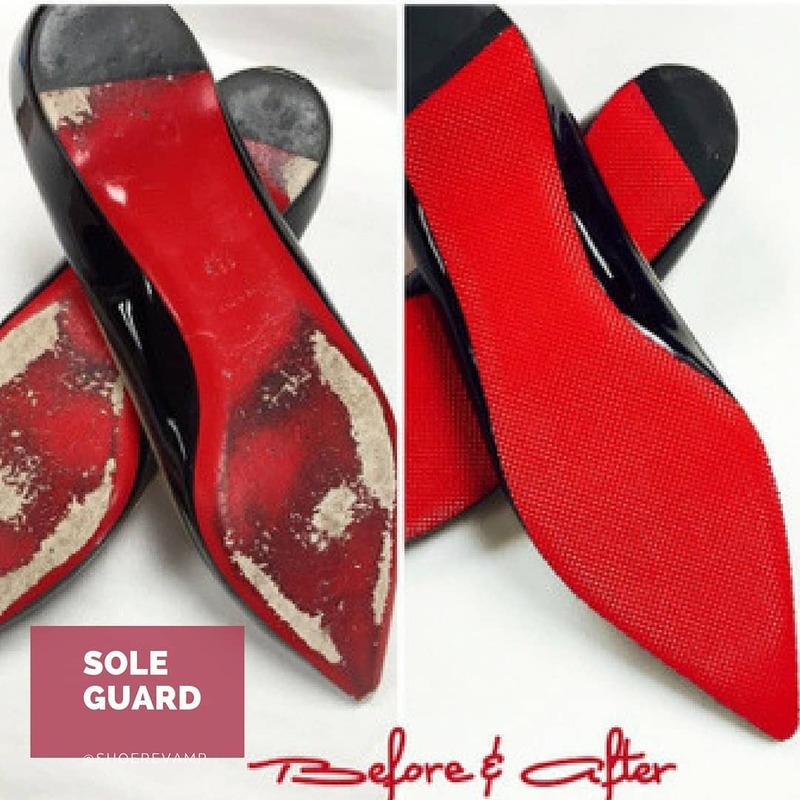 We don't want to start explaining to people what we do; we wanted them to know what we offer by mere hearing or seeing ShoeRevamp. People easily identify with a brand name when the meaning connects with their day to day lifestyle. That was what informed the decision to stick with the name. I guess my training in consumer psychology also helped in understanding the power in accurate brand naming. 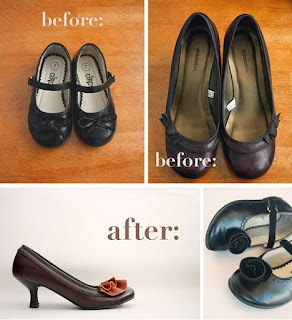 KMB: Can you sum up in a few words what it is you do with shoes and other items you revamp? 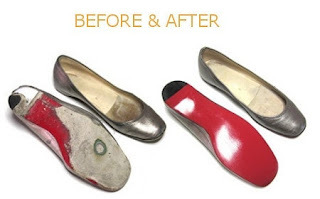 ShoeRevamp: We simply give new life to shoes that are destined for the trash by using quality materials and modern technology to make that happen too. KMB: Can you kindly mention some of the services that your brand renders? New heels or heel tips. KMB: Are cobbler shops a vestige of the past? Shoe Revamp: Certainly, they're! Customer behaviors are changing pretty fast. We all want services that are consistently high quality, hyper-accessible and modern. This is what ShoeRevamp is setup to fix. We let you skip the cobbler shop by getting your shoes fixed with just a few click of your phone. KMB: What challenges have you had to deal with since starting out? How did you turn them around? 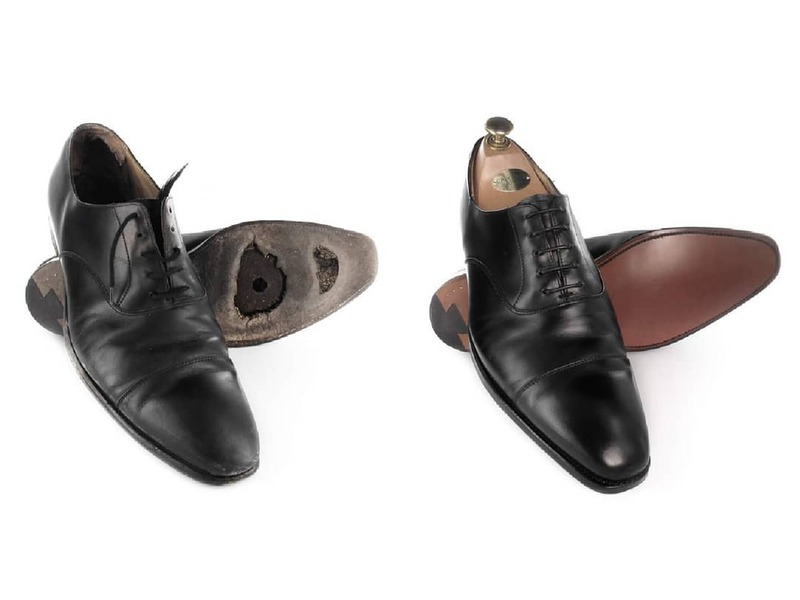 Shoe Revamp: Finance was initially an issue. But I got to realize that you should start with what you've got and where you are. The Government has no plan to help. I remembered applying for government seed funding that never came through. Banks are a no go area for startups in Nigeria and that’s very Sad. In the end, I had to bootstrap myself and get going. KMB: Does that mean there's still a market for shoe repair? Shoe Revamp: Yes, there is. 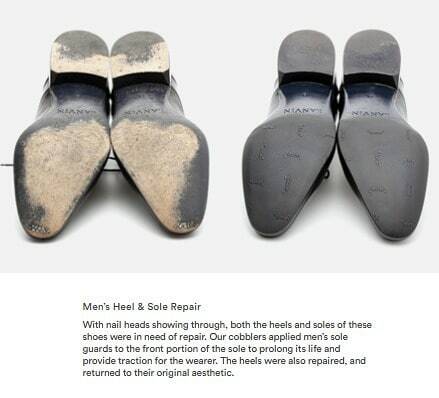 People buy Shoes everyday but the quality of cobblers isn't growing rather it is declining. Our grand cobblers are getting old and the Younger ones prefer white collar jobs. KMB: Is it cost-effective to have shoes repaired instead of buying a new pair? 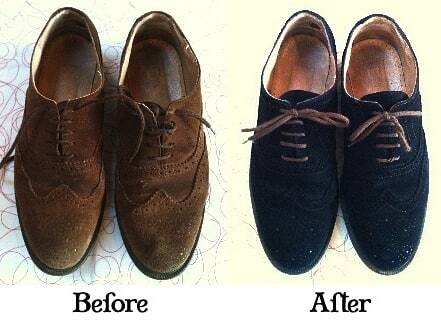 Shoe Revamp: Absolutely! Although it depends on how the shoe is used. For example, do you know you can actually resole your shoes up to 10 times before you discard? Quality shoes I mean. Each time you repair your shoes, your save money and utilize the funds for other pressing needs. This way, you also get to protect the environment. 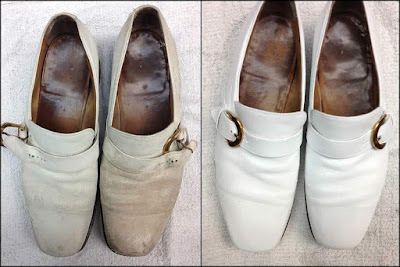 KMB: Do you think the quality of shoes changed throughout the years and how? Shoe Revamp: Quality shoes are super expensive these days. 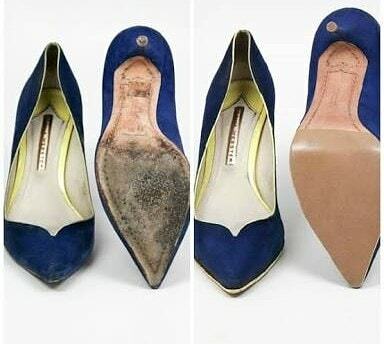 We've seen influx of shoes into Nigeria with very minimal durability quotient. 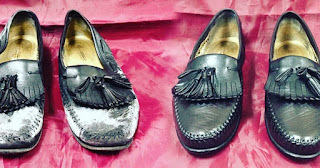 Most handmade shoes in Nigeria stand better when compared to what are being shipped down to us. KMB: How has the market reception been for you since inception? Shoe Revamp: The market has been quite receptive to be fair. Of course people expressed skepticism at first due to their past experiences with other cobblers. But we've proven our worth largely due to results of our services. KMB: What are the most common things you're asked to do when clients patronize you? KMB: What can people do to prolong the lifespan of their shoes? Shoe Revamp: Treat your shoes with care. 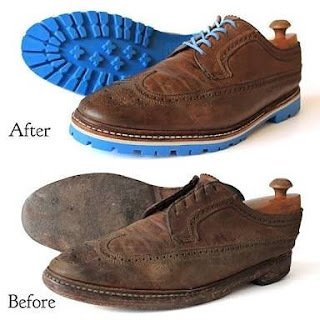 Polish them occasionally to prolong the lifespan of the leather. 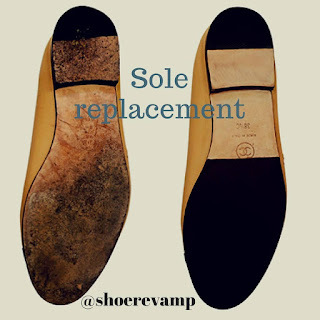 Ensure that you patronize professional cobblers. Take no short cuts. 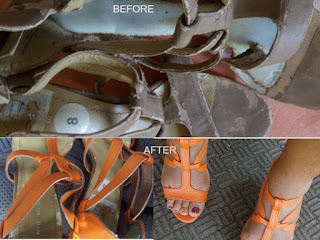 KMB: How much time do you take repairing each pair of shoes? Shoe Revamp: It depends largely on the level of repairs required as well the expertise of the cobbler in most cases. We spend hours or even days on some and few minutes on others. KMB: What do you look for when you buy a pair of shoes for yourself? KMB: What would you recommend to someone who wants to work with shoes the way you do? Shoe Revamp: Spend time learning the craft. No short cuts except you want to end up ruining people's shoes. Most importantly, humility, love for shoes and an eye for details. Being teachable is also critical in this line of trade. Just bury the damn pride! KMB: How will you like those interested in your services to contact you?